- Simply brilliant story/setup for a science fiction game. Limitless possibilities and not stale in the least bit. -Animations look industry leading for this type of game. -Sorry Fallout 4, but this looks better than The Witcher 3. -Unbelievably interesting looking combat, especially for an RPG. Love the tether gun used to take down the TRex looking machine. I'm not a fan of the games this developer is known for, but this game looks fantastic. It was totally unexpected and I'm looking forward to seeing more. It's definitely in my top 5 most anticipated games now. This is fresh as f*ck. What a nice surprise. So goddamn happy the gameplay matched up with the concept art. Guerilla Games have been much maligned for Killzone but they have always been good games but I really felt that GG needed a new genre to really showcase their talents. This was game of the show, even better than Fallout 4 and Uncharted 4. Something new, fresh and unique. Bravo GG and Sony. Absolutely deserving of its own thread, thanks for making it THL. Easily 'game of the show' for me. So exciting to see a completely unexpected reveal, of an original IP, in one of my favourite genres, bringing such interesting new concepts to the table! The overall setting and theme is fantastic, the visuals are phenomenal, and the gameplay looks to have a ton of potential. The trailer initially had me thinking Horizon was simply an Action-Adventure game, which is fine, but I was surprised and even happier to later learn that it's apparently an Action-RPG, which imho raises the possibilities for awesomeness tenfold. I can't wait to learn more! You know, and I know this is blasphemous, but I was watching that trailer and I thought to myself "This is what Zelda would look like if a competent western developer took the reigns of that franchise". I really hope this one delivers. So wow this game. I have been gleaning through all the information of behind the scenes demo. Where to start!? It has cities where you can take quests, buy loot etc. Everywhere is explorable and as far as I am aware just one big map. The machine t-rex we saw in the demo was damaged already which was Aloy took it down so easily in the demo, and they also reduced the machine to 3 attacks in the demo when it has 12. It will be much harder in the game, it basically had like half its health. There is a levelling system where you upgrade and get perks but also crafting and harvesting is a big part of the game. This is important because some weapons like the explosive arrow are quite sparse and must be used carefully to not waste ammo. Another thing is you have to study and observe the enemies and learn their attacks by trial an error, it seems similar to the witcher 3 in that you must prepare yourself before attacking big enemies, it seems the CD Project red recruits have had a big impact on the studio. Another thing is they recruited RPG people from Obsidian, Bethesda and CD Project Red to help them make an RPG for the first time. For example the person who made the Baron quest in the Witcher 3 is at Guerilla. Guerilla have a stream today of giving it a more in depth look. Hoping for more gameplay. I think the reaction to it has surprised them and Sony. 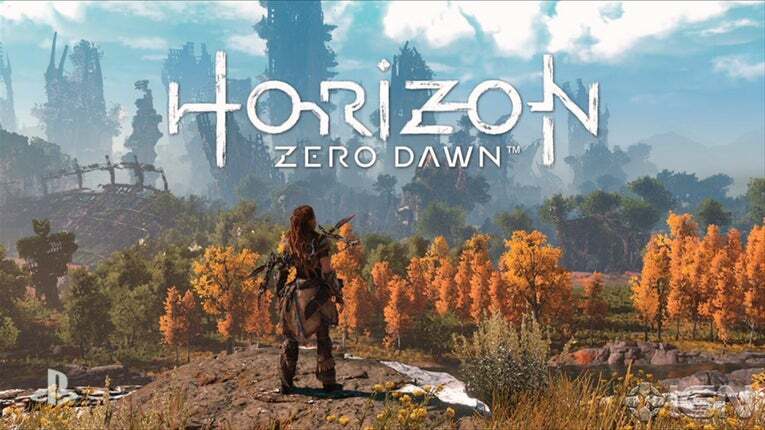 Art director Jan-Bart van Beek confirms that Horizon: Zero Dawn will run at 1080p/ 30fps using a modified version of the Killzone: Shadow Fall engine. van Beek has already told us that Horizon: Zero Dawn will focus on player trial and error with the absence of tutorials, and we’ll find out more about the game during a Twitch live stream later today. Horizon: Zero Dawn is due for release in 2016 for PS4. Stream is at 5pm BST, wooot. Means I can actually watch it. Game looks quite damn good. One of my most anticipated. Can't wait to play as Ygritte. I've enjoyed everything GG has released, so I'm definitely looking forward to Horizon. I do hope the leading lady there isn't chatting the entire time, though. I'm guessing it was demo related, however. It seemed to be used a way to inform the viewer what is going on, without having on-screen prompts. and I totally missed the fooking live stream. Anybody know if it is re-uploaded somewhere? I look forward to it since I like GG, but I seem to be on the only person on the net who thought shooting a compound bow at a giant metal robot was really stupid. Maybe it has to with having actually used a bow, but that aspect is really going to be hard for me to stomach. I do hope the leading lady there isn't chatting the entire time, though. They have only ever done FPS games, though, right? Horizon looks far more interesting in game-play & concept than any of their other games, IMO. Killzone 2 and 3 weren't mediocre too. They were both great games, especially Killzone 2. Here's a senior producer at Guerilla giving a breakdown of the E3 trailer. Interesting bits about the relationship between Alloy (?) and the machines, color scheme, lack of loading screens, XP, and the types of ammo. I've never played a Killzone title before -- they never interested me, and I heard they were only average as shooters -- but I enjoy RPGs, so this one is on my radar. I'm not as gung-ho as a lot of people are, because Guerilla's talent seemed mostly limited to graphics (based on what I heard about Killzone, anyhow) -- everything else being fair/competent but not much beyond that. Maybe they've really hit their stride and their creativity is going to bloom, I don't know, although I suspect we'll end up with an 8.0 to 8.5-range RPG. We'll see. The thing that intrigues me the most about it is the interesting setting and possibly the story/lore. Game looks cool. The only criticism I have in this early build is the animation is kind of a mixed bag. Some of it looks great, some looks stiff. PS4's Horizon RPG Elements Somewhere Between Assassin's Creed and Skyrim. 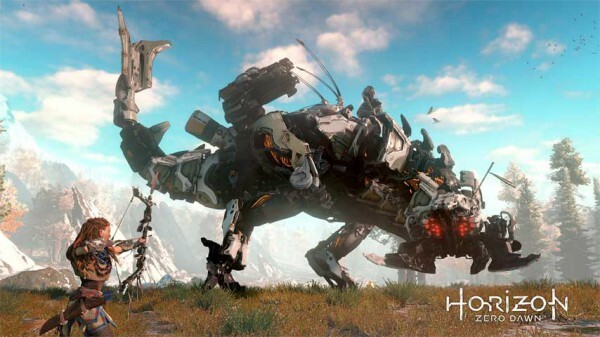 When Sony announced Horizon: Zero Dawn, the next game from the creators of Killzone, back at E3, the company confirmed it would have some role-playing game elements. But how much of an RPG is it really? Will it offer the same kind of depth as a game like The Witcher 3: Wild Hunt or The Elder Scrolls V: Skyrim? GamesRadar put that very question to Guerrilla Games co-founder and managing director Hermen Hulst as part of a new interview. "I guess you're wondering where we are on that spectrum of, on the one side more action-orientated games like Assassin's Creed, and on the other hand you have your Elder Scrolls and these kinds of series," Hulst replied. "I think we're in-between. We have elements in both directions, and that probably puts us somewhere in between." Hulst went on to say that it's "really difficult" to explain the depths of Horizon's RPG elements without being able to show it off. This will come later. "Once we have something to show we'll talk about it in more detail," he said. Also in GamesRadar's interview, Hulst reveals that Guerrilla fielded 35-40 pitches from its employees as part of its brainstorming session years ago for a new IP. A couple of ideas were considered before Guerrilla ultimately settled on what would become Horizon. "We looked at certain trends in them and certain core elements, and we decided to take some of that forward into a prototyping stage," he said. "We actually, at that point, still took a couple of concepts further, but the Horizon concept was, even from very early on, already appealing to all of us and so we decided to concentrate on that." The ambitious-sounding Horizon has a full day/night cycle and players will get to explore forests, mountains, and "atmospheric ruins of a bygone civilization." Oh, and there are also robot dinosaurs. Great job of making sense out the vague answer previously given, not. I like the main character Aloy. She's not the the typical cutezie character you see in games today. She has red dreadlocks and It matches the story perfectly. The TGS gmeplay is impressive. We know for sure it's actual gameplay running on Ps4 hardware. The fact people think its he same video from E3 says a lot. Nothing was downgraded from what I seen but the hair is a little more brown than red? I cant wait to see more. They mentioned climbing mechanics and shopping in towns. The game really does lend it itselft to hack n' slash RPG mechanics though. Game is intriguing. Has major potential and looks awesome. When I first saw this game at E3, I was totally blown away, like everyone else did. Amazing graphic, gameplay looks great, etc. Definitely looking forward to hear more about this game in the future.